One video, likely not intended for release while bin Laden was alive, showed the Al Qaeda leader watching himself on satellite TV, while sitting on the floor wrapped in a blanket. 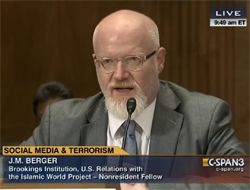 The remaining four videos appear to be raw footage from propaganda pieces. The latter videos beg the question: Why haven't we seen them? Or have we? 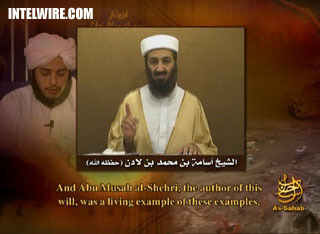 Two of the videos released today closely match the very last video publicly released by bin Laden, on the occasion of the anniversary of September 11 in 2007. Bin Laden is wearing the same clothing and looks to be about the same in terms of age and beard coloration. That video was released in a very low quality version in which the image actually froze midway through bin Laden's speech and stayed that way until the end. Since 2007, bin Laden's releases have all been audio-only. They haven't even included new still pictures. Meanwhile, Ayman Al Zawahiri and other Al Qaeda leaders have issued a procession of high quality videos with no significant technical problems. Bin Laden had changed his appearance and was holding back images to protect his anonymity. Bin Laden was hiding somewhere where he didn't have access to good recording equipment. Bin Laden was so frail and unhealthy from living in a cave without his dialysis machine that he couldn't project enough strength to justify a video. Today's release, along with news that bin Laden had been squirreled away in his Abbottabad manse for years, never emerging from the house and with his kidneys working just fine, make it clear that none of these reasons apply. The fact that bin Laden went to the trouble of dressing and dying his beard for these tapes indicates that he intended for them to be seen. So why weren't they released? Media honcho Adam Gadahn and video starlet Ayman Al Zawahiri have some 'splaining to do. While one can construct a Machiavellian rationale that they intended to perpetuate one or more of the above theories, that seems a bit cumbersome to me and the tradeoff of failing to project strength doesn't seem especially compelling. It's possible (and before this week I would have said likely) that Gadahn or Zawahiri controlled the release mechanism for the videos. They were the gatekeepers, so to speak, and the video had to pass through their hands before being released to the forums. However, the more we learn about bin Laden's secure location and his apparent operational relevance, the more that premise has to be re-examined. It may very well turn out to be true, but it doesn't look like a slam dunk given the latest revelations. Who decided that Osama bin Laden's face would no longer be seen? What were their reasons? Was it an attempt to protect bin Laden or to marginalize him? Or maybe it's as simple as bin Laden was recording RMVB files and Gadahn didn't have the right codecs to convert them for editing? Stay tuned. The information download from Abbottabad is only just beginning. Can "Lone Wolves" Travel In Packs?